Sprüth Magers is proud to present Edward and Nancy Kienholz: A Selection of Works from the Betty and Monte Factor Family Collection. The exhibition encapsulates both the friendship and patronage between the artist and two of his most steadfast collectors, Betty and Monte Factor. Controversial, graphic and always critical, Ed Kienholz’s installations and sculptural assemblages reproduce in tableaux form the ugly truths of modern life often bypassed by artistic representation. Large-scale, freestanding environments built out of materials salvaged from junkyards and alleyways survey subjects such as illegal abortion, prostitution, racism and mental illness. Kienholz rose to prominence in the Los Angeles art scene of the late 1950s. In 1957 he co-founded the Ferus gallery with the curator Walter Hopps and it soon became the epicentre of avant-garde art in the city. In 1958 he left the gallery to pursue his own artistic practice and during the 1960s he began to spend a lot of time in Hope, Idaho close to where his friends Monte and Betty Factor lived. Here, from 1972 onwards, he collaborated on all works with his wife, Nancy – initiating a long and fruitful working relationship between the couple that lasted the rest of his lifetime. In direct preparation for his life-sized environments, Kienholz made smaller assemblages and collaged elements of particular objects therein. He coined these ‘drawings’ and, as preliminary studies, they played an integral part in the process of making his full-scale works. This exhibition brings together several Kienholz ‘drawings’ all related to major works by the artist. In addition, an early assemblage with moving parts, The Medicine Show (1958-59), is presented. In Drawing for Five Car Stud (1969-72), Kienholz has created a wall work from the inner-face of a dislocated car door. The image of a tableau of figures is inserted in the window cavity. The scene refers to the iconic work Five Car Stud, first exhibited at Documenta in 1972. This controversial installation, shown only a few times since, details a violent episode of contemporary racism. Four cars and a pick-up truck, whose lights illuminate the scene, encircle a series of life-cast models. Five white men surround a black man who is restrained on the ground as one of his attackers attempts to castrate him. Kienholz has explained that the victim has been singled-out by the perpetrators for drinking in the company of a white woman. She hides in one of the cars, vomiting. It is perhaps her position that viewers of Drawing for Five Car Stud occupy as they view this grievous scene through the car window. Other drawings within the exhibition correspond to works including Barney’s Beanery (1965), which is in the collection of the Stedelijk Museum, Amsterdam; Still Live (1974), a major work about risk and contingency in life that was once banned by the German police and A Portable War Memorial (1968), a work concerning US international policy that is now in the collection of the Museum Ludwig, Cologne. During the 1950s, Monte Factor and his wife Betty were active in liberal politics. It was through this association that the couple became acquainted with many artists. Walter Hopps introduced them to the Los Angeles art scene, where they were involved with the Ferus Gallery and made life-long friends with Ed Kienholz. The Factor family collection includes works by Robert Irwin, Larry Bell, Craig Kauffman, Ed Moses, John Altoon, Richard Jackson, Andy Warhol, Kenneth Price and many more. Describing how the Factors became patrons of Ed Kienholz, Monte recalls that in the early 1960s he and his wife scraped together a small amount of cash, as well as some clothes and an old boat, to buy a work from the artist. Some years later they purchased The Illegal Operation (1962), a powerful and important piece that was acquired by the Los Angeles County Museum of Art in 2008, but which the Factors had kept stored in a spare room for many years. A larger presentation of Edward and Nancy Kienholz’s work including additional drawings, photographs, letters, and ephemera, that document and contextualise their exchange with the Factors, will follow later this year at Sprüth Magers Berlin. The twinned exhibitions not only provide a glimpse of rarely seen pieces by one of the most important artists of the twentieth-century, but also an historic record of the Factor’s patronage of early contemporary art in Los Angeles. Edward Kienholz (1927–1994) was born in Washington State. He moved to Los Angeles in 1953 where he abandoned abstract painting and wall reliefs in favour of installation. From 1972 onwards he collaborated with his wife, Nancy Reddin Kienholz (b.1943), who continues to create and present her and her late husband’s work internationally. 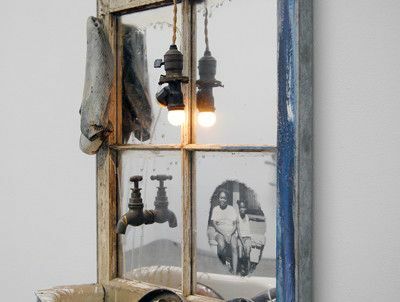 Edward and Nancy Reddin Kienholz have exhibited solo shows at the Lousiana Museum of Modern Art, Denmark (2012, 1979); the Los Angeles County Museum of Art, (2011, 1971); the National Gallery, London (2009); the Whitney Museum of American Art, New York (1996) and Musée National d’Art Moderne, Centre Pompidou, Paris (1977).